This topic provides a reference to all of the portal templates that are available. Note: For information on the In-Page experience templates, see Overview of Gallery In-Page Experience Templates. When you create a new Gallery experience, you will choose a template which controls the overall look and feel of the experience. Selecting the type of experience you want to create will filter the list of templates. When clicking Portal, the template chooser can be used to filter the portal templates based upon your site requirements. Note: After you select a template, the template cannot be changed. The following templates are available when creating Portal, Landing Page and Event experiences. For information on the In-Page experience templates, see Overview of Gallery In-Page Experience Templates. Note: Custom templates can also be developed with the help of Brightcove Consulting. Contact your account manager for details. Portal templates provide a set of page templates that can be customized. The page templates can be viewed by opening the Gallery Site Editor and then by clicking PAGES in the left navigation menu. Click on a page name to open the page layout in the editor. 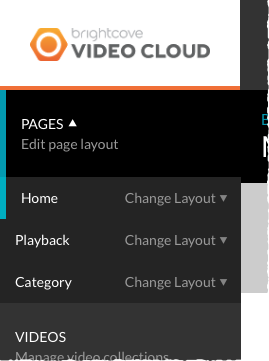 In the above example, Home, Playback and Category pages are available. Note: Some pages also provide the ability for the player layout to be changed. For more information, see Changing the Player Layout on a Portal Experience. Various third-party tracking options are supported based upon the template that is selected. This table outlines supported options by template. To learn more about configuring tracking, see Configuring Third-Party Tracking for a Portal Experience. The Mosaic template provides a continuous array of all-over images with an in-page video player. Related videos appear below. With the Mosaic template, visuals dominate the site. The Mosaic template provides a highly visual site and is recommended if you want a graphic-centric viewing experience. This template is best suited for smaller libraries of content without a large category base. Page-level ads and calls to action are also supported. The Mosaic template provides two page layout templates. 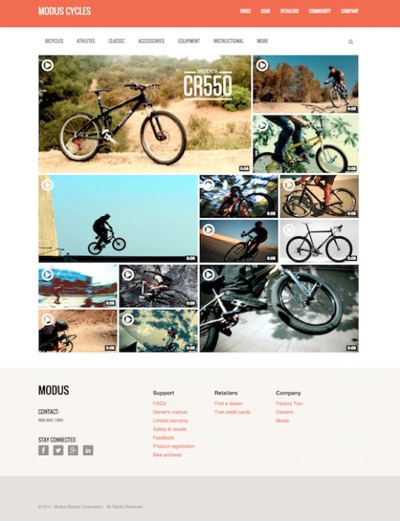 Click here to see a sample site using the Mosaic template. The Classic template provides three page layout templates. Page-level ads and calls to action are also supported. 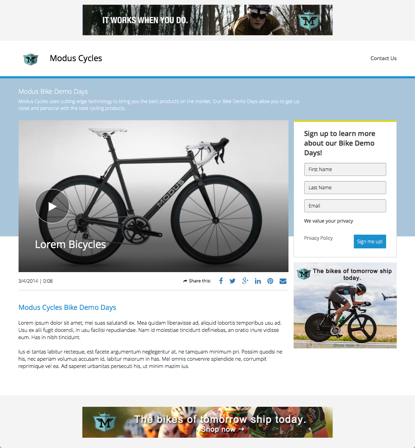 Click here to see a sample site using the Classic template. 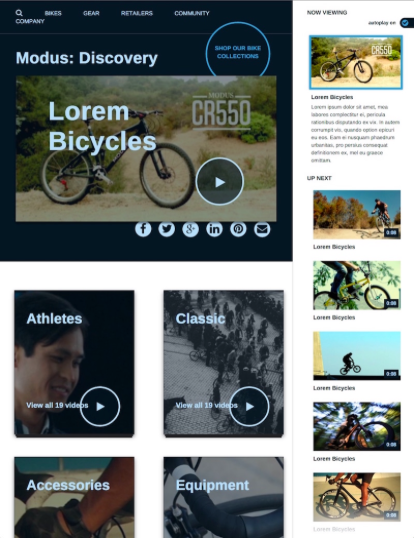 The Marquee template offers a consistent, single-page experience throughout, with a featured video taking center stage and your full video library right below. The Marquee template is recommended if you have one primary video you want to showcase. The Marquee template provides three page layout templates. 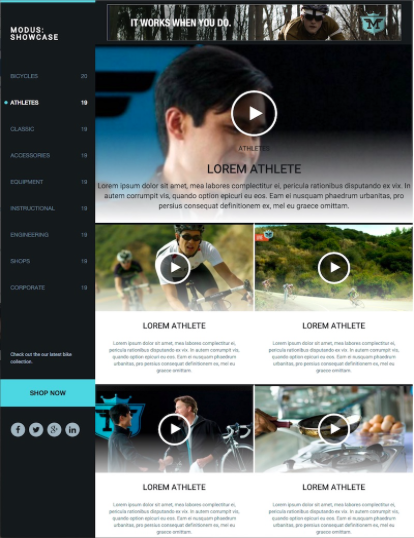 Click here to see a sample site using the Marquee template. Page-level ads and calls to action are also supported. 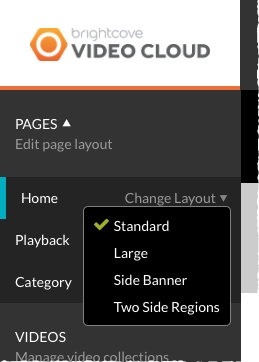 The Marquee template also offers the ability to change the player layout for all of the pages by clicking on the Change Layout link next to the page name. The current layout is indicated with a check mark. The following layouts are available. For more information on changing the player layout, see Changing the Player Layout on a Portal Experience. 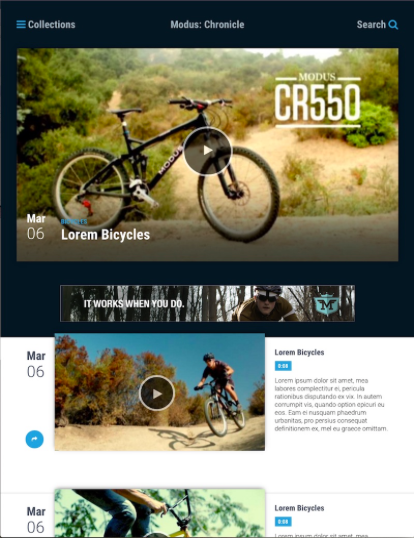 The Publisher template features a video-centric and image driven home page. Publisher supports easily discoverable video, hover over video descriptions, and categories and subcategories of content. Page-level ads and calls to action are also supported. The Publisher template provides three page layout templates. Page-level ads and calls to action are also supported. Click here to see a sample site using the Publisher template. The Discovery template is suitable for large libraries of content and allows the viewer to browse through the content in a grid format. This is a graphic-centric template with limited room for editorial content. The Discovery template provides three page layout templates. 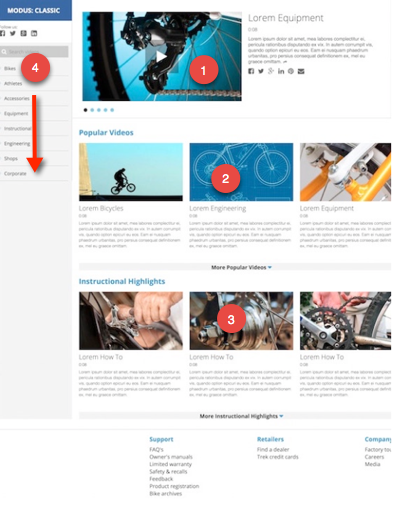 Click here to see a sample site using the Discovery template. 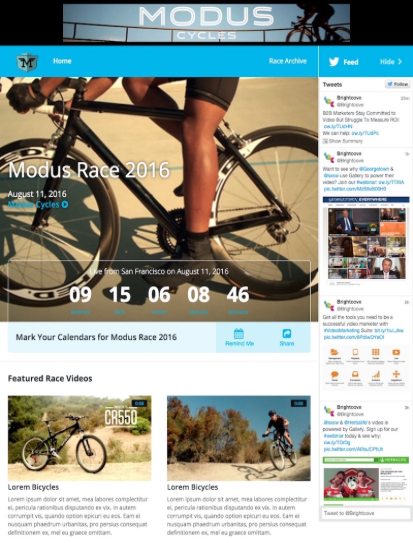 The Live Event Portal template is designed to deliver live content to your audience. The Live Event Portal template offers pre-, during, and post-event states and supports page-level ads and calls to action. Third party integration can be used to add chat and commenting features. The Live Event Portal template provides five page layout templates. Click here to see a sample site using the Live Event Portal template. For complete details on using the Live Event Portal template, see Creating a Live Event Portal Experience. The Landing Page template is designed to deliver a single video with the ability to add a call-to-action and lead form. The Landing Page template provides only a Home page layout. Click here to see a sample site using the Landing Page template. For complete details on using the Landing Page template, see Creating a Landing Page Experience. The Showcase template is suitable for large libraries of content and allows the viewer to browse through the content in a grid format. This is a graphic-centric template with limited room for editorial content. The Showcase template provides three page layout templates. Page-level ads and calls to action are also supported. 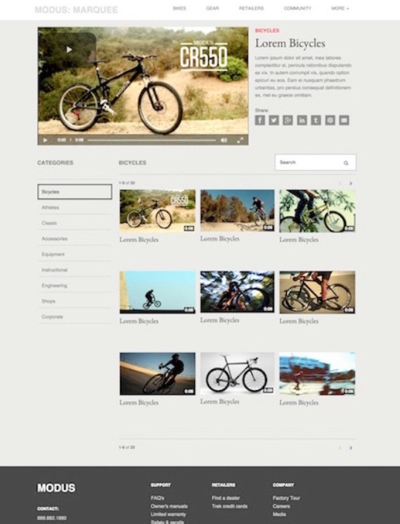 Click here to see a sample site using the Showcase template. The Chronicle template is suitable for large libraries of content and allows the viewer to browse through the content in a grid format. This is a graphic-centric template with limited room for editorial content. The Chronicle template provides three page layout templates. Page-level ads and calls to action are also supported. Click here to see a sample site using the Chronicle template. The Catalogue template is suitable for large libraries of content and allows the viewer to browse through the content in a grid format. This is a graphic-centric template that supports up to 4 levels of hierarchy and supports custom images and descriptions for collections. The Catalogue template provides three page layout templates. 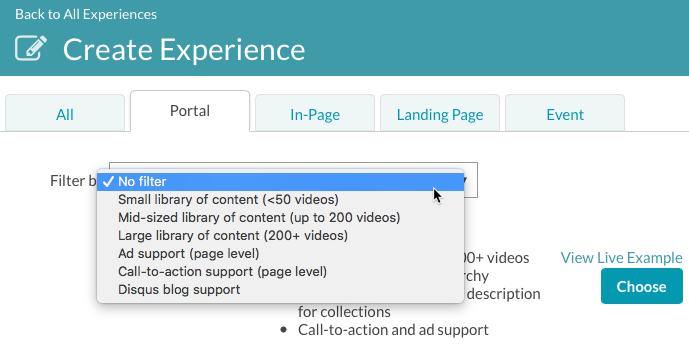 Page-level ads and calls to action are also supported. Click here to see a sample site using the Catalogue template.